Hand To The Plough: Bedroom Project: tell me what you think. 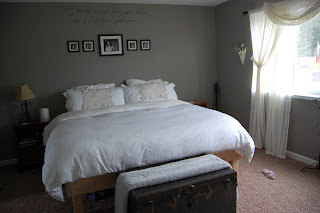 Bedroom Project: tell me what you think. I'm asking for input here. Tell me what you think of these photos. I need input. This room is a mystery to me. I never got to ask myself what, exactly, my "dream bedroom"would look like. I'm heavily influenced by what I already have, and things that are meaningful to me. My great-grandmother, Lila (for whom Grace is named), hand-tatted these doilies. They might look a little "froo-froo" under other circumstances, but ..........because they were hers, I love them. I just don't think I'd ever see them in a store or photo and think, "I really really want those hanging in my bedroom." This is the bed frame Ben made. I'm thinking of adding an upholstered panel to the front and sides as well as a headboard. 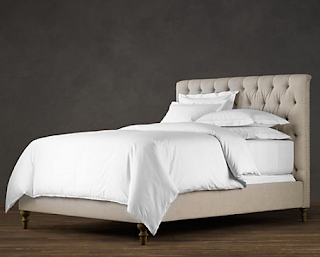 Kinda like this Restoration Hardware bed. I'm having a hard time finding linen, though. I have had to search online for something the right color. All that is in the stores right now is white linen....for Easter, I guess. 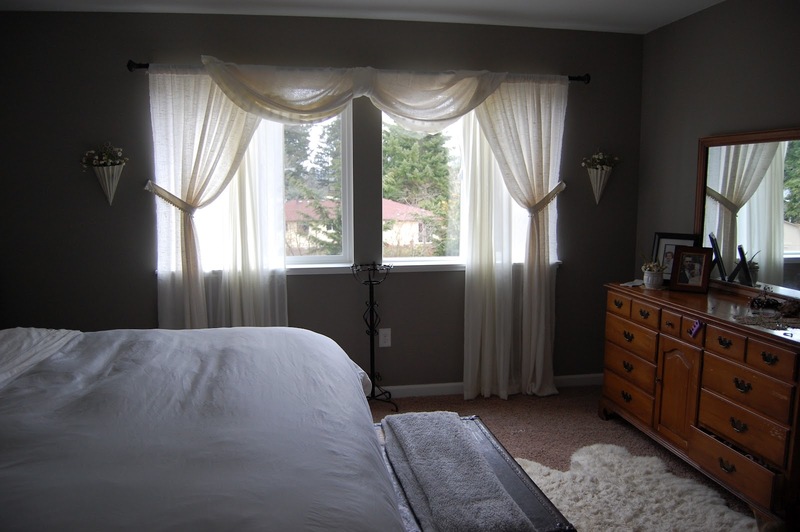 Here's the curtains....still just pinned up, not sewn. I'm trying to get a-hold of the feel of this room first before making the drapes permanent. Do we like the flowers on the wall vases? I just don't know.........I don't want it to become too girly. I'm using them because I have them. Pretty much that's it. This last one has crewel embroidery on it. I AM IN LOVE WITH CREWEL. 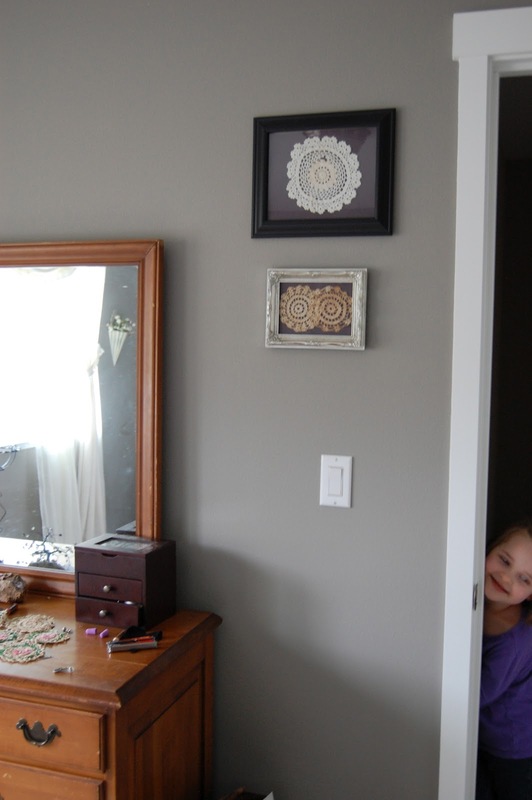 My friend, Hosanna has been doing her own crewel embroidery since she was a teenager. I think it's the most exquisite home decoration I've ever seen! Violet saw me messing with the burlap on a pillow and said, "It'll be pretty ruff, Mom. Pretty ruff for sleeping'!" I agree with Lis. 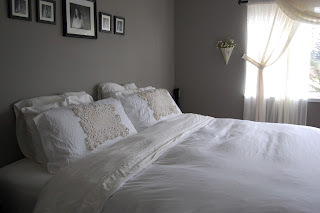 I think the lace on the pillows is lovely - but a bit girly; but the framed pieces on the walls I think you could get away with. 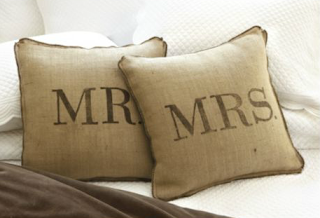 I, too, love burlap. I haven't made pillows of curtains with it yet but I have used it to accessorize; especially at Christmas. If they're only throw pillows it doesn't matter if it's "ruff". 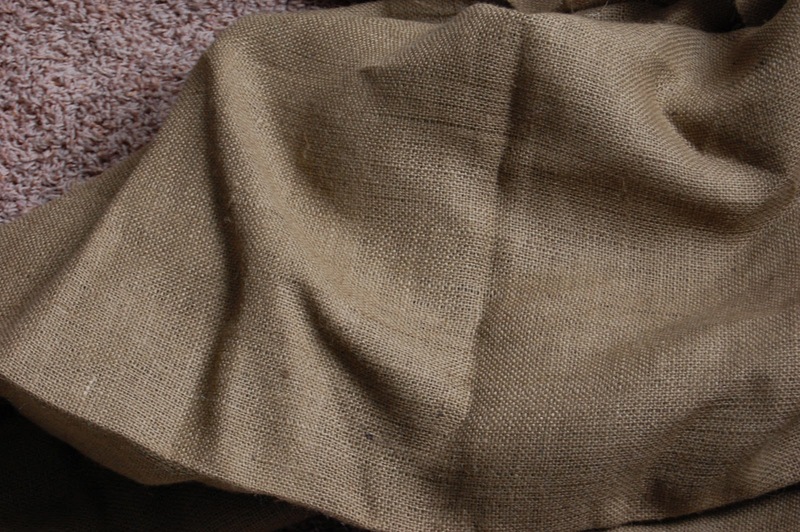 :) I've never tried doing crewel on burlap; the weave is a bit loose and not uniform enough for attaching crewel stitches to; but I have seen some burlap with a finer weave that could be embroidered fairly easily, using a coarse wool crewel three-ply crewel yarn - not pearl cotton. I think a nice moderately curly design would be passable; but nothing too floral. 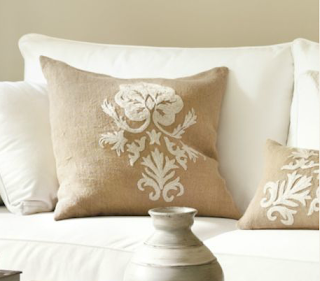 Maybe you could applique the pillows? Something else I did with burlap accessories was PAINT it. It was a cinch. I'd go with greenery in your wall sconces. As for manly men - when I set up house with Kevin, his one stipulation on the bedroom was no pink. I have floral sheets on the bed, and he doesn't care. I think as long as you stay away from frilly, lacy, pinky frou frou you're fine. Love the family heirlooms in frames, love the bed-yes go for it if you can upholster the headboard! I'd skip the sides because the will probably get dirty to easily (little feet, etc. climbing up. I would not put flowers on either side of the window. 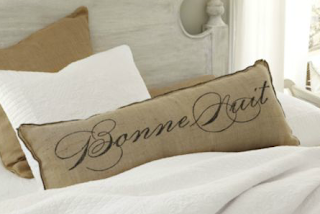 Love the burlap for a accent pillow, but maybe only one? I liked the long skinny one with writing on it! The room is looking awesome!